Chickens are for life, not just for Christmas, and that’s why we are offering a free Chicken Keeping Starter Pack Plus with every Eglu Classic Chicken House until Christmas eve! Whether you want to make chicken keeping a new hobby in 2013, or you want to treat someone you love to the gift of hens this Christmas, your free Starter Pack will prove very hendy. Worth £60, the Starter Pack includes bedding, grit, a cleaning spray and several health products to give new hens the best start in life. 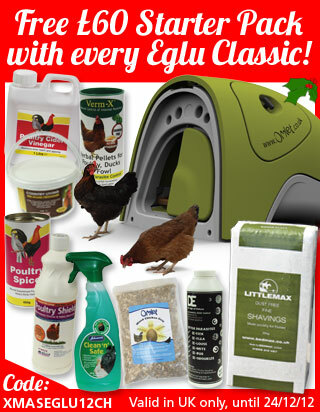 Order an Eglu Classic Chicken House until midnight on Christmas Eve and use code: XMASEGLU12CH to redeem your freebie. Double Qute Now Available to Buy! Introducing our latest product…the Double Qute. This stylish home for hamsters and gerbils has all the fabulous features of Qute, but double the size! Pets will have plenty to space to scamper, burrow and play in the Double Qute, and they can hop from one side to the other. The hole can be closed off using a divider plug, separating the two sides, which means you can clean one side while your pets are safe in the other. The deep bedding trays provide plenty of room for pets to build nests and dig burrows, and you can see it all through the clear plastic. 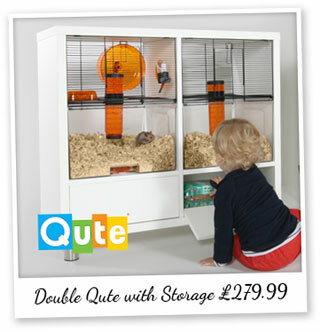 Buy the Double Qute with Storage and you’ll have somewhere to keep all your pet food and accessories too! The Double Qute is quick and easy to clean – just remove the bedding trays and rinse out while your pets are safely stowed in the top section. Pet-friendly and child-safe, it would make a brilliant present for any little boy or girl this Christmas, and you won’t be ashamed to have it on display. Check their water regularly. Many Eglu owners have a spare Glug handy to swap over if the water has frozen in the cold weather. Put your hens to bed early. Shut them in their Eglu a little earlier in the evening, so that you don’t forget to do so when it’s too dark. Add a Heavy Duty Cover. Attach to the Eglu run to shelter hens from rain and prevent the area becoming too muddy. Bark chippings work wonders too! Protect combs and wattles. A good layer of Petroleum Jelly or Comb and Wattle Protector will do the trick! And how about a slathering of Chicken Poop Lip Balm for yourself!? Keep the choccies to yourself. They won’t do your hens any good, but you can always treat them to some Dried Mealworms instead. Save on Your Chickens Subscription! There’s still time to get your eggsclusive saving on a subscription of Your Chickens magazine, just in time for Christmas. Treat your favourite chicken keeper to a gift that will last all year, or make it a little New Year present to yourself. Click here to make your saving today!